Diabetes and depression occur together approximately twice as frequently as would be predicted by chance alone. Comorbid diabetes and depression are a major clinical challenge as the outcomes of both conditions are worsened by the other. Although the psychological burden of diabetes may contribute to depression, this explanation does not fully explain the relationship between these 2 conditions. Both conditions may be driven by shared underlying biological and behavioral mechanisms, such as hypothalamic-pituitary-adrenal axis activation, inflammation, sleep disturbance, inactive lifestyle, poor dietary habits, and environmental and cultural risk factors. Depression is frequently missed in people with diabetes despite effective screening tools being available. 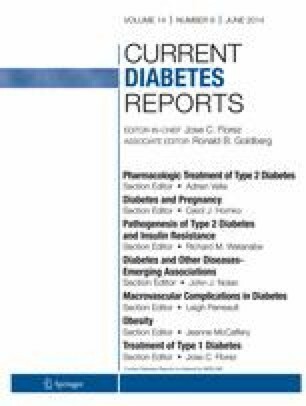 Both psychological interventions and antidepressants are effective in treating depressive symptoms in people with diabetes but have mixed effects on glycemic control. Clear care pathways involving a multidisciplinary team are needed to obtain optimal medical and psychiatric outcomes for people with comorbid diabetes and depression. Richard IG Holt has acted as an advisory board member and speaker for Novo Nordisk, and as a speaker for Sanofi-Aventis, Eli Lilly, Otsuka, and Bristol-Myers Squibb. He has received grants in support of investigator trials from Novo Nordisk. Mary de Groot and Sherita Hill Golden declare that they have no conflict of interest. International Conference on Diabetes and Depression. Available at: http://www.niddk.nih.gov/news/events-calendar/Pages/international-conference-on-diabetes-and-depression.aspx.